The Neo-Pure PH-27292-05 High Efficiency Pleated Filter is manufactured in the USA with materials that comply with materials FDA requirements and are NSF 61 certified.The filter operates at 90% filtration efficiency and is suitable for use in the filtration of liquids as well as edible oils. Reduces Sediment and Rust. The Neo-Pure PH-27292-05 filter is manufactured using Synthetic Polypropylene for improved reduction of sediment, dirt and rust. High Efficiency. The 90% filtration efficiency of the Neo-Pure PH-27292-05 is suitable for filtration of liquids and edible oils. Pleated Filter Design. The pleated filter design of the PH-27292-05 offers an extended surface area to provide a longer filter life, high flow rates, and increased dirt-holding capacity. High Value At A Competitive Price. The PH-27292-05 High Efficiency filter offers an economical and competitive price while providing	exceptional performance and high adsorptive capacity. Low Maintenance. Maintenance costs are reduced due to the cartridge having a longer service life and requiring fewer filter changes. The filter is cleanable and reusable in most applications. WQA Certified. The Neo-Pure PH-27292-05 is tested and certified by the WQA against NSF/ANSI 61 Standard. FDA Compliant. The filter media meets FDA/CFR Title 21 regulations for food and water contact. Made in the USA. 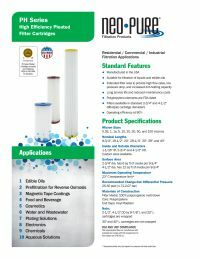 The Neo-Pure PH-27292-05 filter cartridge is made and manufactured in the US. Surface Area: 18 sq. ft.